About two months in a late night Netflix search I happened upon a little show called The Great British Baking Show, known in Great Britain as The Great British Bake Off. I didn’t realize it at the time but I was embarking on a television endeavor that would become an obsession. One episode would turn into two and two episodes would become three and before I realized it my Netflix binge landed me awake and wide-eyed during those awkward twilight hours where the only noise in your house is the dishwasher and odd industrial tink and hum. During these evening hours I would think to myself Where can I get castor sugar and I should really learn how to do a proper plait (also known as a braid to the rest of us Yankees). I think part of the reason I like to cook now and can cook somewhat well is that I can appreciate good food when I have it and I grew up eating it. With that said the first time I knew I wanted to learn to bake was when I watched Hook. Yes, I’m talking about that awesome Peter Pan movie with Robin Williams. You remember, don’t you? There’s a scene in that movie where the boys have a food fight and throw all these delicious looking pies. In retrospect, it was probably just vibrantly colored cool whip but as a child, I thought it looked so enticing and was always a bit sad that there so much good looking food was going to waste. But that scene ignited something in me that was only strengthened when I started to watch Duff’s original cake decorating show Charm City Cakes. After watching his show I vowed to learn the art of cake decoration and I did just that. I remember the first cake I made was an ice cream cake. Not really technically a cake but it was something I could practice using my Wilton tips on. From there my skills grew. 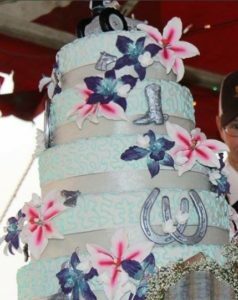 My ultimate goal was to bake a wedding cake and fortunately, I got to do that last summer. It was my most complicated cake and by far my most stressful. The bride was so carefree and easy going but I was so stressed about every detail and worried for weeks about the construction and delivery of it. Fortunately, everything worked out great but I don’t know how anyone could put themselves through that on a regular basis. Check it out below. With that said I felt pretty confident in my skills… that is until I started to watch The Great British Bake-off. These “amateurs” were baking things that shook me to the core (I mean the bread lion come on!). I’d never even heard of a genoise sponge until the show. I realized that all my baking was focused on making sturdy yet delicious cakes for decorating. I have some awesome cake recipes but they are constrained to that purpose. Other than the occasional pie, cookie or biscuit I was rarely making anything new. And don’t get me started on bread (it still terrifies me!). Just like all those years ago when I saw the first pie on the movie Hook, I have a fire lit within me. I don’t want to just make beautiful cakes, I want to make beautiful bread and tarts and quiches and hot water crust. God, I cannot wait for the hot water crust! That is why I have decided to bake every challenge in the Great British Bake Off show’s history. I am truly excited and I think I’ll be a much better baker by the end of it. I’ve already learned so much from just watching the show. Now I’m itching to try the challenges. I have also decided to share my journey because I love to create websites and take food photos. I know so millennial of me. What can I say? I’m unashamedly so. I hope you enjoy reading about my journey as much as I like baking my way through it! Please feel free to leave comments or questions and I’ll try to respond as quickly as possible but please remember this page is meant to be lighthearted and fun. I am by no means the best baker, just a baker with the desire to become great… maybe Great British Bake Off quality one day! Most importantly, I hope you remember to eat great bakes!